Did you have a great NSD on Saturday? I did! I organized and purged and cleaned and then actually got some scrapbooking in! I had to clean up so I could take some photos, because this week and next we'll be featuring tours of our Design Teams scrap spaces. Hopefully you'll get some ideas and inspiration for YOUR space! Today, let's tour Natalie's space! My craft space is in the second bedroom (turned office) of our condo. 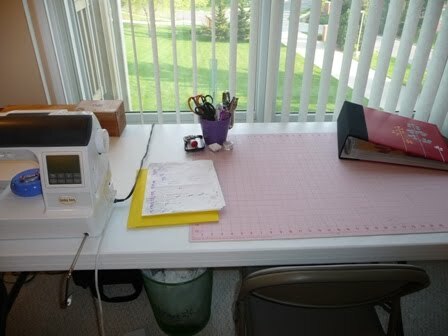 A year or two ago, my husband and I bought this 6-foot table at Sam’s Club so that I could have a designated place to leave my crafts out that wouldn’t be in the way (previously, I just took over our dining room table, which was a problem when we wanted to eat!). This table is where I do most of my scrapbooking (I have been known to cart my supplies out to the living room and crowd them onto a tray table while I’m watching TV or playing games with friends!). Right now it’s super-clean, because our condo is on the market. Usually it’s covered in scraps and partially-completed projects. While I am the kind of scrapbooker who cleans everything up after each project is finished, this is a little *too* clean for normal! My most-used tools are out on the table (even when it’s ready for showings! ): you can see my sewing machine (I also do quite a bit of sewing when I get the chance), a few of my sewing tools, my project 365 album, and my little purple flowerpot of scrapbooking tools. My beloved Silhouette SD usually sits out on this table, too! The closet is filled with my crafting supplies. Recently Husband and I did a huge overhaul of our office to get it organized for putting our place on the market. The closet is neater than it has ever been! I have filled it with plastic Sterilite drawer organizers. I have a really big one for (most of) my fabric and sewing supplies, a tall, narrow one for miscellaneous craft supplies, and two stacked 12x12 drawer units for my papers. Stacked on top are additional supplies, as well as my big basket of ephemera and photos to scrapbook. I got this idea from my friend. Each event or moment (from my big list!) has an envelope or folder. 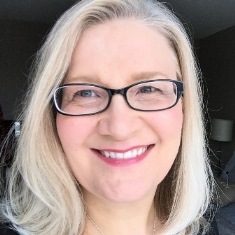 I save my little bits to scrapbook in that folder—photos , ticket stubs, brochures, scraps of paper with journaling (If I can, I like to write out my journaling right away so that I don’t forget what I wanted to say! ), and scraps of paper with layout ideas. 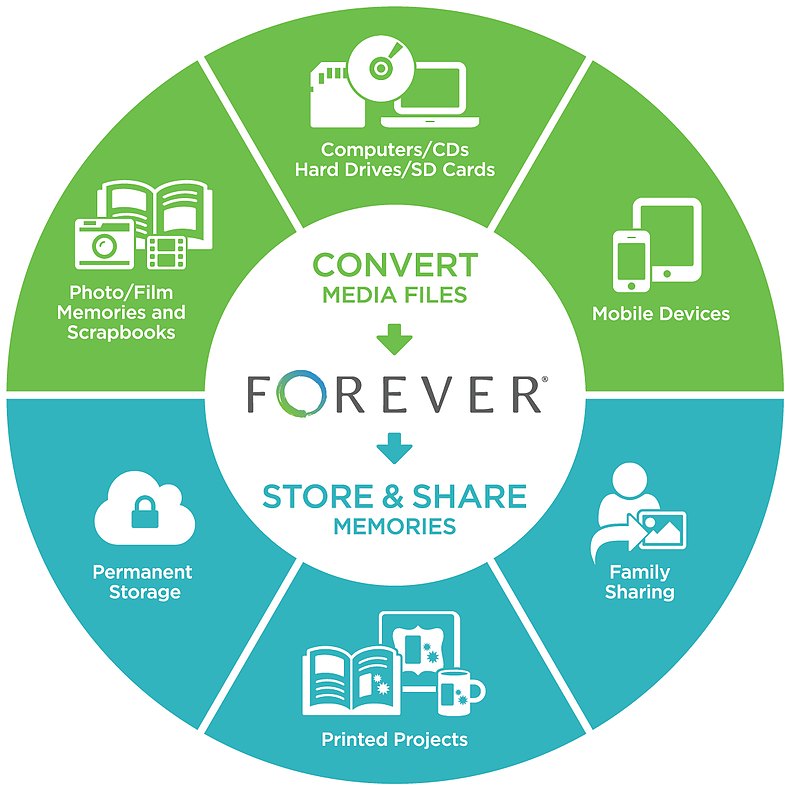 When I get time to scrapbook, I flip through the folders in the basket (they are organized approximately chronologically) and find one that I want to scrapbook that day. 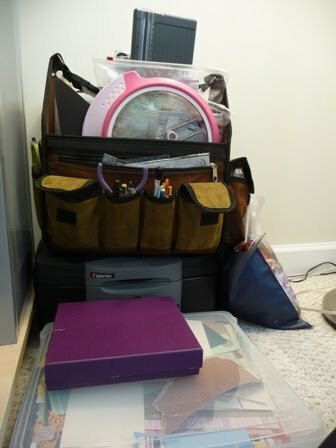 Of course, all of my scrapbooking stuff does not fit into that closet. The rest of it is crammed into a little corner between our computer desk and my craft table (on top of our fireproof box-haha!). 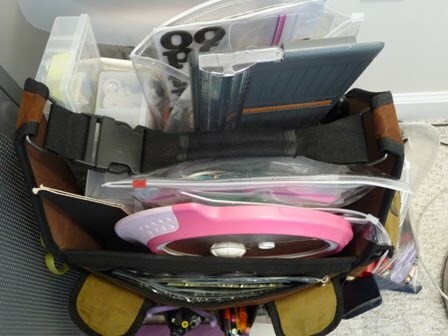 My scrapbooking bag is overflowing with my embellishments in divided plastic boxes and larger tools (like my circle-cutter and my paper trimmer). 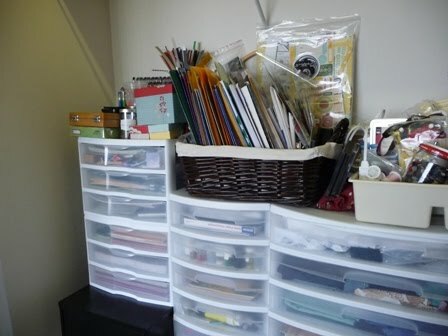 I have a 12x12 clear plastic box for my scraps as well as a bag full of ribbons and trims to the side. 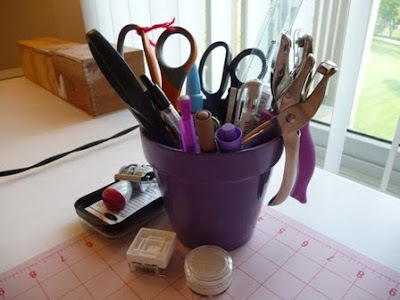 I hope you’ve enjoyed the “tour” of my little craft space! 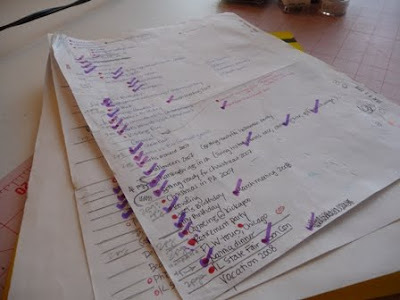 Thanks Natalie...you are super organized! 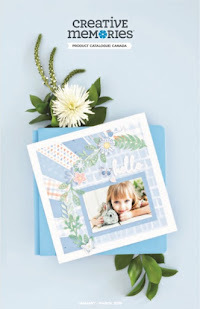 I love your colorful flower pot and your layout list...I am going to have to try that! Join us tomorrow for another crafty space! Great organizing ideas - I really like the envelope/folder one! 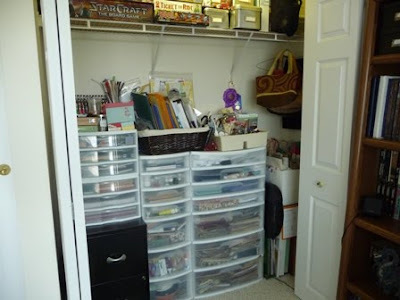 I love that you have a closet space in your area!